Like Rick said in his post, it's disheartening to have had only one showing and no other interest in the house in the month that it's been on the market. We want so badly to be at the cabin that I fear we are losing track of taking every advantage of where we live now. We both feel like we're just marking time here, plodding along day after day. Our bodies are here but our hearts and souls are at the cabin. So, I just told myself to "buck up" and take things as they come. There are much worse places to be than where we are right now. Besides, it's early days for selling the house. Just wait until the pool is open and it looks like a private resort in our backyard. We just have to get them to come! Our yearly cabin trek is fast upon us! In three weeks we'll be heading west. We decided to go in the Spring this year instead of Fall for several reasons. For one, we just want to go. For the most important one, we need to get busy and kill all the Canadian thistle that is threatening to take over our newly cleared meadow. Since they did manage to get in and burn the slash piles this past winter, the ground is ripe for the thistle to take over. Once it does there is no getting rid of it. Killing thistle is first on our list. We'll also plant a native grassland mix of grasses and wildflowers that we planted way back when the cabin was first built. 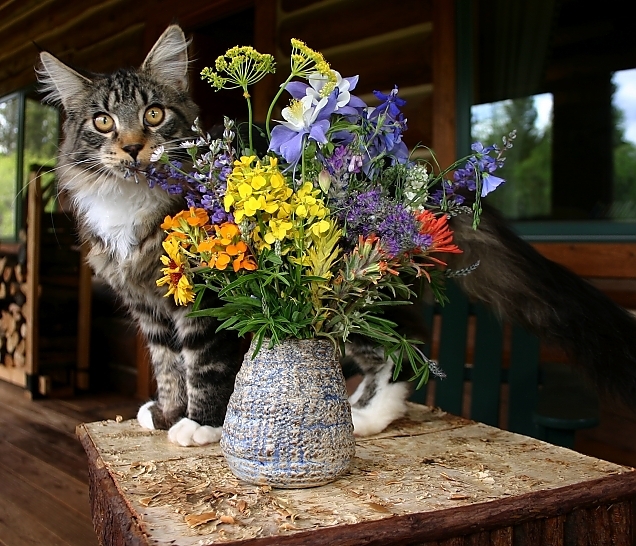 Sam (above) is posing with posies all picked from around the cabin. I don't expect to see this many flowers in bloom in early June (especially the columbine which bloom later) but I hope the trees are leafing out. We're not sure what vehicle we'll head out west in -- Big Red or Lex. Big Red certainly knows the way, but Lex is a complete rookie. Lex is smaller than Big Red so I'm not sure that he can hold all the stuff we have accumulated to take with us. I think we'll have to do a trial pack to see if we can fit everyone and everything in. Lex is more luxurious for sure and we are anxious to see how he handles the dirt roads. But if we leave Big Red behind in New Jersey will she pine away? She's made the trek soooo many times. It will more than likely be another "working" vacation and not all play and jigsaw puzzles. Grant from Laramie Heating will most likely be coming to install our new furnace. Poor Grant! He's always been the one to come and rescue our furnace woes: everything from extracting dead squirrels out of the exhaust pipe more than once, to it just plain not working. A new furnace is definately called for. I know we have more work-like things planned in preparation for moving but right now I can't recall them. I need to start looking at all the notes we made last year about what have in the way of stocked grocery items and make some lists. We also need to look at measurements we made last year and see if some of our things here are going to work there, such as my favorite pine dresser which I am hoping is going to fit beside the bed now that we've rearranged the bedroom. Time to start planning for the trek!